I’ve updated this post to reflect Cyber Monday deals for 2014! These prices are much better than the Black Friday deals! I’ve told you before, we received a KitchenAid Stand Mixer as a wedding gift many years ago, it’s still one of my most-used kitchen items. I think of this item as an investment. If you spend a lot of time in the kitchen, the price of a KitchenAid is well worth the price. Here are the best Black Friday deals on the KitchenAid Stand Mixer. There are several models available so watch the prices. *These prices are MUCH higher than last year, keep watching for price drops on Amazon.com. Affiliate links may apply. 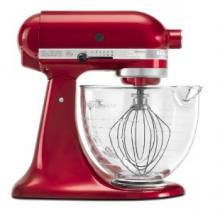 KitchenAid Professional 600 Series 6-Quart Stand Mixer $209 Shipped!